The National Secretary of the IDF National Committee of Italy Dr Massimo Forino (left) and the President of the IDF National Committee of Italy, Mr Luciano Negri. Italy has become a new signatory of the Dairy Declaration of Rotterdam, which brings the total number of signatories to 24 to date. The IDF National Committee of Italy, Assolatte (Italian Dairy Association), Confcooperative (Confederazione Cooperative Italiane) and AOP Latte Italia (Association of Producer Organisations of Latte Italia) inked the Declaration on 1 June 2018 in Cremona, Italy. Mr Luciano Negri, President of the IDF National Committee of Italy, said: “I’m proud to have contributed to the realization of this important event. 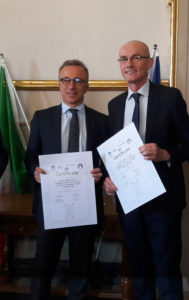 With the signing of this document, the Italian dairy chain demonstrates that it is in the forefront in recognizing sustainability issues that are central to the Italian dairy sector, which has always been committed to producing high-quality products with high nutritional and sensory value for the well-being of consumers all over the world. “This step will give even more impetus to the activities aimed at building a sustainable dairy supply chain which is aware that the world of tomorrow is the responsibility of all of us, and it is built with the decisions we take today,” he added. Italy joins South Africa, Cyprus and the Pan-American Dairy Federation (FEPALE), which comprises the dairy sectors of 20 countries in the Americas, as the latest signatories of the Declaration. The IDF National Committees of South Africa and Cyprus inked the Declaration in December 2017, with FEPALE in November. The other signatories include China, France, Poland, UK, US, Germany, The Netherlands, South Korea, New Zealand and Australia. These signatories represent more than half of the world’s milk production. ‘We encourage more countries and members of the dairy chain around the world to sign up to the Dairy Declaration in support of sustainability and the positive contributions to food security, employment generation, poverty reduction and the management of ecosystems to maintain biodiversity,’ said Ms Caroline Emond, Director General of IDF. ‘Capacity-building in best practices is important to enable dairy farmers and producers to develop integrated approaches towards sustainability which will benefit the global community while generating socio-economic growth,’ she added. The Declaration was jointly launched by the International Dairy Federation (IDF) and the UN Food and Agriculture Organization (FAO) in October 2016 during the IDF Dairy Summit in Rotterdam. It signifies commitment by both organizations to the sustainable development of the dairy sector which encompasses economic, social, health and environmental dimensions. The Declaration also recognizes the essential role of dairy products for balanced, nutritious and healthy diets.